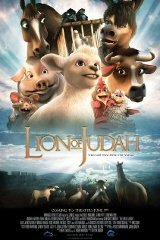 Follow the adventures of a bold lamb (Judah) and his stable friends as they try to avoid the sacrificial alter the week preceding the crucifixion of Christ. It is a heart-warming account of the Easter story as seen through the eyes of a lovable pig (Horace), a faint-hearted horse (Monty), a pedantic rat (Slink), a rambling rooster (Drake), a motherly cow (Esmay) and a downtrodden donkey (Jack). This magnificent period piece with its epic sets is a roller coaster ride of emotions. Enveloped in humour, this quest follows the animals from the stable in Bethlehem to the great temple in Jerusalem and onto the hillside of Calvary as these unlikely heroes try to save their friend. The journey weaves seamlessly through the biblical accounts of Palm Sunday, Jesus turning the tables in the temple, Peter's denial and with a tense, heart-wrenching climax, depicts the crucifixion and resurrection with gentleness and breathtaking beauty. For Judah, the lamb with the heart of a lion, it is a story of courage and faith. For Jack, the disappointed donkey, it becomes a pivotal voyage of hope. For Horace, the, well the dirty pig, and Drake the ignorant rooster, it is an opportunity to do something inappropriate and get into trouble.